Questions of a clone aims to address developments in genetic science in an aesthetic and thought provoking way. Since the Industrial Revolution, modern technologies have been examined by artists as a way of enhancing human life. Now, genetic sciences are the new frontier of modern technology, providing hope for many, while also coming under a great degree of controversy. 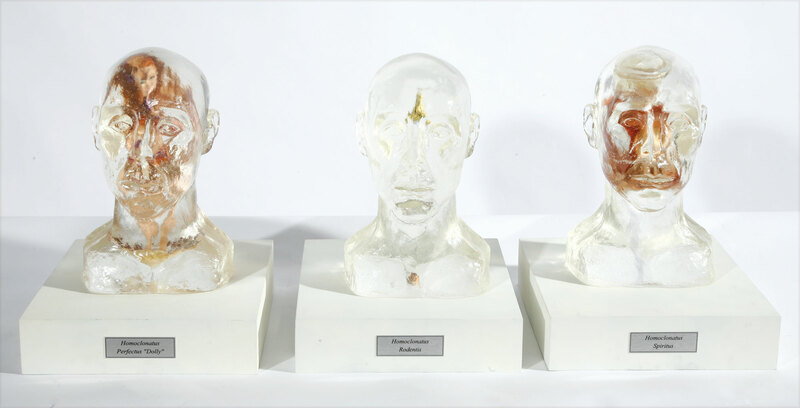 This work addresses the emotional and ethical aspects of genetic technologies and the implications these have for the audience. In a world where humans can be identically created, what does it mean to be human and individual? Each head structurally addresses a specific issue (hope, fear and human life as a commodity) while together they act as a symbol of the clone and pioneering science.